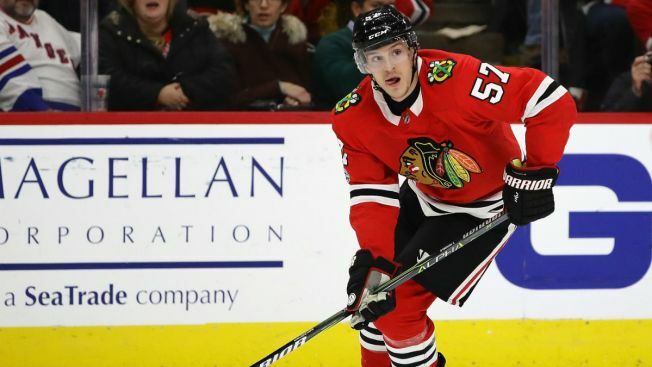 The Chicago Blackhawks have had plenty of homegrown players over the years, but Tommy Wingels and Vincent Hinostroza did something on Thursday night that has never happened in the 90-plus year history of the franchise. Hinostroza, born in Chicago, and Wingels, born in Evanston, both scored for the Blackhawks as they thumped the Winnipeg Jets 5-1 and ran their winning streak to four consecutive games. According to the Elias Sports Bureau, the goals from Hinostroza and Wingels marked the first time in Blackhawks history that two players that were born in the state of Illinois had both scored for the team in the same game. The goal was Hinostroza’s first of the season, and Wingels’ goal was his fifth of the campaign and his third in the team’s last four games. For those curious about the team’s history of Illinois-born players, defenseman Chris Chelios, a Chicago-native, holds the records for most goals and assists scored in Blackhawks history, with 92 goals and 395 assists to his credit in 664 games with the team.